This extraordinary collaborative work by women from around the world brings a new sense to the Bushian phrase by making a statement of hope and peace in an age of chaos. The album contains 14 lullabies from Iran, Iraq, North Korea, Palestine, Syria, Afghanistan and Cuba, sung by women from these countries including Rim Banna, Mahsha Vahdat, Sun Ju Lee, Jawahar Shofani, in duets with 'western' artists including Nina Hagen (Germany), Eddi Reader (Scotland), Sarah Jane Morris (England), Lila Downs (USA/Mexico) and Mimi (USA), all within compositions by Knut Reiersrud and a group of musicians from Norway and the world. Thus the record forms 14 small musical bridges between east and west, north and south. A complete track, sound samples and artist listing follows below. The way things are today, this is a daring and poignant recording. Daring, because the songs featured all come from countries that are in the headlines these days, usually in a negative way, all of them associated with pain and suffering. Poignant, because this is not about making a righteous stand: this is, first and foremost, a record of haunting music and a fusion of East and West of the utmost caliber. I have very seldom taken part in projects of which I truly can say that they changed me as a person. It might have happened four or five times before. Now it has happened again. 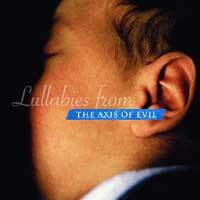 I am speaking about the CD Lullabies from the Axis of Evil. The album contains 14 lullabies from Iran, Iraq, North Korea, Palestine, Syria, Afghanistan and Cuba. Every lullaby is presented in its original form sung by women from these countries, and then a western version with interpretations in English sung by singers like Nina Hagen (Germany), Eddi Reader (Scotland – Fairground Attraction), Sarah Jane Morris (England), Lila Downs (USA/Mexico) and Mimi (USA) is attached to it, within a musical landscape composed by Knut Reiersrud. Thus the record forms 14 small musical bridges between east and west. In the world of today, there is a need of the power of lullabies. They are more reliable than most of the hits we find on the charts these days. They will remain when most of the digital dust from the porous music business has fallen to the ground. They are the point where the cultures and civilisations of the earth meet each other, or rather the common starting-point from which they grow into diversity. In the world of today the lullabies are more sustain than the weapons of Bush and Al-Qaida. But it is not a given fact that all people hear them. It is not a given fact that the mothers' voices are heard at all. Most of what the media brings us is the language of power, generally spoken by men.